lt;stronggt;AVE09901lt;/stronggt;lt;BR/gt;Avery Durable View Binder with Two Booster EZD Ringslt;BR/gt;Durable construction is ideal for frequent reference. EZD rings have a higher page capacity compared to the same size round rings. Ring resists gapping for smooth page turning. Organize and secure paper with four interior pockets. Wider panels cover standard dividers and sheet protectors. Pages lie flat with back mounted rings. Holds 8 1/2amp;quot; x 11amp;quot; documents. Locking ring mechanism holds sheets securely. Capacity Range Max: 5amp;quot; Sheet Capacity: 1,050 Colors: White Binder Sheet Size: 11 x 8 1/2.lt;BR/gt;lt;BR/gt;lt;stronggt;CLI61217lt;/stronggt;lt;BR/gt;Avery Durable View Binder with Two Booster EZD Ringslt;BR/gt;Heavyweight polypropylene pages with reinforced binding edges hold your important business cards for easy reference while at the office or on the road. Organize your business cards with this holder and keep contact information accessible. Pages fit standard three-ring binders. Each page can hold up to 20 business cards and has convenient side-loading sleeves. 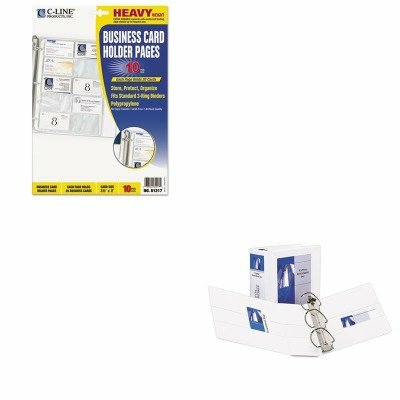 Card File Refills Type: Business Card Binder Page Card Size H x W: 2amp;quot; x 3 1/2amp;quot; For Card Size: 2amp;quot; x 3 1/2amp;quot;.